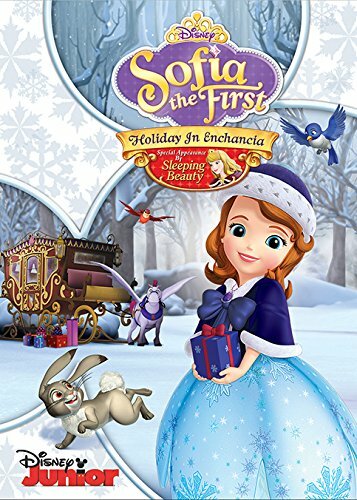 Sofia the First Holiday In Enchancia DVD was created for kids age 2-7 and their parents/caregivers, Disney Junior’s Emmy Award-winning “Sofia the First” follows the adventures of Princess Sofia, a young girl who is learning how to adjust to royal life after her mom marries the king. Along the way, she discovers that the inner character of kindness, generosity, loyalty, honesty and grace is what makes a real princess. “Sofia the First” is the #1 TV series year to date with Girls 2-5 and holds the all-time record for the top two cable TV telecasts for kids 2-5. When a snowstorm prevents King Roland from returning home in time for the holidays, Sofia leads her family on a brave expedition to find him. Princess Aurora from Disney’s “Sleeping Beauty” makes a special appearance to help Sofia and her animal friends reunite the royal family. HOLIDAY IN ENCHANCIA celebrates the greatest gift of all: spending special days with the people you love! This DVD contains five great episodes. 1. Holiday in Enchancia – King Roland can’t get home in time for the Wassailia holidays. Princess Aurora makes an appearance. 2. Baileywick’s Day Off – Baileywick’s brother Nigel is in town to celebrate Baileywick’s Birthday. 3. The Little Witch – A lonely young witch named Lucinda is hexing the village children. 4. The Baker King – King Roland makes a wish for a simple life as a village baker. 5. Four’s A Crowd – Sofia is jealous of Jade and Ruby’s friendship with Amber. Amazon is always the best place to order DVDs from. You get great prices plus free two-day shipping free with Amazon prime! The little ones will like this movie. Forget the kids I love Sofia the First! It is such a sweet show. this looks adorable! have to get this very soon! Sounds like an adorable movie. I don’t watch many princess movies with having 3 grandsons. This has become one of the best children’s shows. I love how they’ve incorporated so many Classic Disney characters , like the 3 Good Fairies! I was so glad when I found out they came up with a holiday episode for this show-they hardly ever do those, anymore! Of course, my favorite part is with Princess Aurora, my favorite Disney Princess! My nephew’s daughter watched this DVD and she loved it! I love that this show is still on and has retained its high quality. It’s nice that little girls have something wholesome and positive to watch with their family and friends. It’s neat that they are doing a crossover special with Disney’s newest princess, “Elena of Avalor”!